Barrington Plastic Surgery, Ltd. offers a full aray of reconstructive and aesthetic surgical procedures. 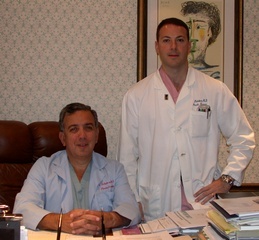 Both Dr. Vincent and Dr. Christopher Pelletiere perform the full spectrum of plastic surgery procedures including hand surgery, reconstruction after trauma or cancer, skin cancer treatment and repair, burn treatment, wound reconstruction, and the full spectrum of aesthetic procedures, both surgical and non-surgical. Consultations are available Monday through Friday, depending on the schedule and request. There is a fee for aesthetic consultations; however, this is waived if surgery is scheduled. For reconstructive surgeries, the consultation fee will be sent to your insurance company. There is no time limit during consultations, or even follow-up visits, since each visit is very personal in nature. Patients are never rushed and are encouraged to take as much time as they need when discussing their problems, surgery, follow-up, etc. All consultations are done with the doctors themselves - there are no patient coordinators, aesthetic consultants, etc. that come between you and the doctors. For out of town patients, much of the consultation can be done via the internet, email, and phone. Surgery is performed in our in-office surgical suite, a day-surgery center, or a local hospital, depending on the health of the patient, the extent of the procedure, and the type of anesthesia required. For reconstructive procedures, we are contracted with most insurance companies. For those companies we are not contracted with, we will still work with them to ensure that the majority of a patient's reconstructive work is paid by insurance and not the patient. We work with Medicare; however, we only accept Medicaid for emergencies. For aesthetic procedures, payment in full is due on the day of surgery. We accept cash, cashier's check, money order, or a check from a financing company that we work with (www.Carecredit.com). We also accept personal checks, as long as we have them a week before your surgery date. We DO NOT accept credit cards. As a practice, we believe that mutual trust, respect, and attention to detail are critical for providing the optimal surgical result for each patient. We also believe in patient privacy and strict confidentiality. We do not advertise in magazines, newspapers, etc. - we let word of mouth from our patients be our referral base, since excellent work and patient rapport speaks much more than any advertisement can. We take pride in the fact that we have an extraordinarily high number of returning patients, with a patient base that encompasses not only the entire Chicago area, but also nationally and internationally, from Europe to South America.